Originally published on Together LA. Perhaps the success of the Union Rescue Mission’s first 5k Walk fundraiser held on Saturday (June 2, 2018) can not be fully gauged by the half million dollars raised (so far) by hundreds of participants, but by the increased level of community involvement. 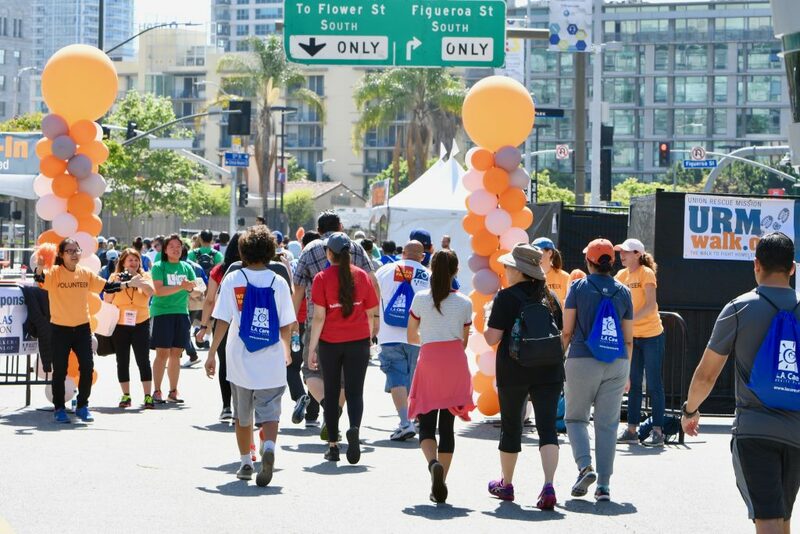 The walk helped the Christian organization that tackles homelessness to move from tapping solely into the rich and famous for funds to inviting the “Average Joe” to be part of the process. A process that includes a leader and partners with epic dreams. Union Rescue Mission 5kUnion Rescue Mission CEO, Rev. 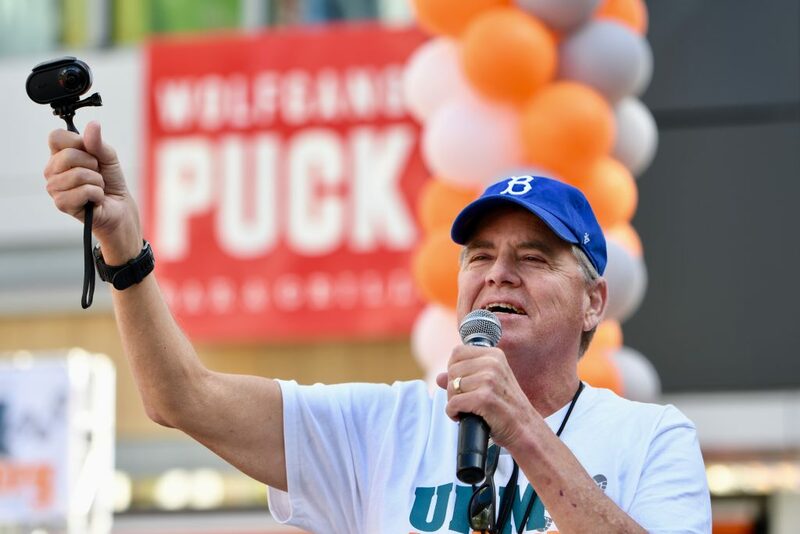 Andrew Bales told Together LA earlier in the week, before the 5k, that the course had to circle LA Live three times rather than having to force businesses on another planned route to shut down for a few hours. Sponsors at the event’s start and finish line manning booths in between the Staples Center and Microsoft Theater included financial giants like Wells Fargo, Costco, and Herbalife, but there was also a prayer tent hosted by a small Downtown LA church. A Christian musical group dubbed “The URM Band” led those awaiting the start of the walk in worship and the atmosphere was filled with joy amongst a backdrop of iconic symbols of financial power. The irony was not lost in the small sea of Average Joes. 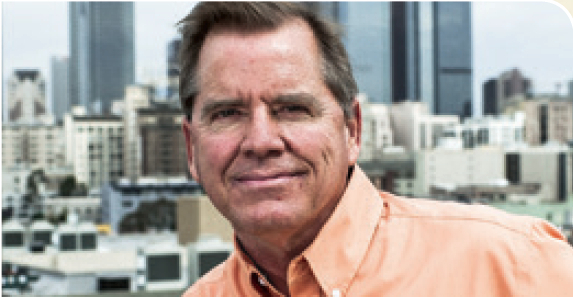 TLA’s interview with Bales below reveals some of the dynamics of homelessness in the city and the Mission’s plans for the future. Together LA: Let’s start with the 5K. How did the 5K idea come about? Rev. 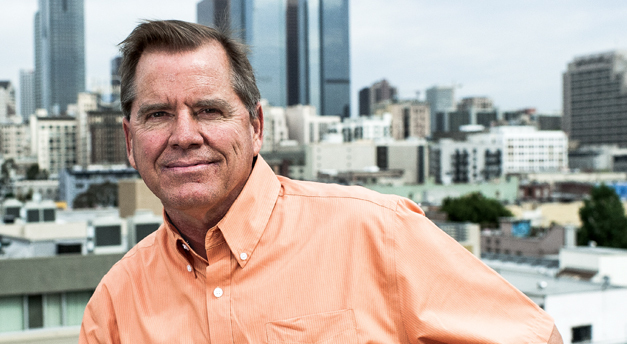 Andrew Bales: So the vision I had was while walking from wherever to Skid Row and back. Richard Newcomb, our board member has helped other groups do successful 5Ks. In fact, he does a 5K every year in New Orleans that he does in honor of his dad. And so years ago, I wanted to do a mud run or something like that and the idea didn’t go over well with our team at that time. But, when Richard came on our board a few years ago and then we had a partner in this idea, we finally had the courage to try to pull it off. So, it really came from Richard and I and his vision for Union Rescue Mission to have a event where the “Average Joe” like us can participate rather than showing up and spending a lot on a ticket to a gala. TLA: So, prior to this 5K what was your major fundraiser for URM? Bales: It’s been our Hearts for Hope fundraiser for Hope Gardens, our site for families out in Sylmar. And we did it for many years at the Four Seasons Hotel. [The fundraiser] started as a fashion show and then became like an entertainment night. The last one we had was at the Beverly Hilton and we actually had Angela Bassett as our emcee (or host) for the night. Our most successful event ever was this Sports LA event at the Hilton three or four years ago where we raised 4.3 million. It wasn’t an URM-hosted event, but we were the beneficiaries. Then, we did our 125th anniversary fall gala at the Beverly Hilton. So, most of our big events have been, you know, kind of expensive. TLA: If you were to have a dream list fulfilled in regards to your ministry what would that be or what would you like to see happen? Bales: Well, we’re busy trying to pull off some of our dreams right now. We’re putting up a sprung structure in our back parking lot. TLA: I’m sorry, what’s a sprung structure? Bales: A sprung structure is heated and air conditioned and it’s more like a permanent tent. It’s not really tent, but it’s like one of those things that people put up to set up a driving range or you know, or hotel puts out for a reception area. It’s a inexpensive, quick way to respond to the need and it’s going to be for 136 single ladies, it’s going to be in our back parking lot (in the city) because of what we’re doing. The city was encouraged by the Urban Land Institute to model something like we’re doing and to put four sprung structures in every district, 15 districts of the city. But they’ve chosen only to do one at this point. We hope that by us doing our sprung structure that we inspire others to get to that point where we have four in each district by the end of the year, that we put a roof over 13,000 people. I know we need to do more than that, but, but at least that’s a start. And then we also are putting up a satellite [facility] in south LA County that’ll be like a mini Union Rescue Mission, about 80,000 square feet for 80 families. It will be for 320 total people, so that people in South LA don’t have to come to Skid Row for help. They can go to South LA. We already have Hope Gardens out in Sylmar for over 60 families, moms and kids, and also 24 senior ladies in permanent supportive housing. And what we want to do is have regionalized services in each area of LA County, decentralize Skid Row so that people in every part of LA County can, you know, if they lose their home, they can go right in their own neighborhood and get help and neighborhoods will help their own neighbors so everybody doesn’t have to come to the mean streets of Skid Row. Then, I would like to create affordable smaller homes. There is a way to do 3D printing, concrete homes that have a bathroom, kitchen, 660 square feet for $10,000 each. And so I, I’d really like to create some neighborhoods of affordable housing that any income could afford to own. So, those are some of the dreams that we have. TLA: Where would the land be for the homes? Bales: We have some land. We have 77 acres out in Sylmar and then we have a donor who has 80 other parcels that I’ve been trying to get a hold of. And then, perhaps we have to go as far as Palmdale and Lancaster. The city owns many parcels of land and the Metro Rail owns lots of land. TLA: How, how has your relationship been with the city? It must be pretty good. Bales: Pretty good. However, they can’t fund us. They won’t fund us. City and County won’t fund us because of our faith. But we have helped model what needs to be done. If you were to call the county 211 number and say, “I’m a dad and mom with three kids,” they’d say the only place to go is Union Rescue Mission. So, they know what we do and respect us and count on us to come through. We never turn away a family with children who comes through our door. We never turn away a woman, a single woman who comes to our door. Rarely would we ever turn away a man. Every night the police call me and see how many bunks we have open and I will never tell them that we have no bunks. So, really we never turn away a man either and that makes us a very unique mission. We’re the only rescue mission that welcomes single men, single women, moms with kids, dads with kids and two parent families with kids. TLA: In a video recently released to promote the 5k you mention how the situation is pretty grave. It’s gotten worse. What would you tell just the average person that looks at the homeless situation, sees that it looks pretty hopeless. How do we address the homeless situation? Bales: If we all work together, we could be like New York City, that puts a roof over 95% of the people experiencing homelessness and is embarrassed about the 5% that are still on the streets. And it’s really an all out, all hands on deck, emergency approach. If we were like that, we would see a different city and we’d live up to be in the City of Angels. In LA, we only put a roof over 25% of people experiencing homelessness and we leave 75% out on the streets, which is destroying and devouring those people. We come up with a lot of excuses. I mean, you know, like the weather is good so people come here. That is an absolute myth and an absolutely false excuse. The majority of people on the streets of LA are Angelenos, longtime Angelenos. You can die from the weather on the streets. We know people who’ve died on the streets of LA. So there’s really no excuse not to act now. Even the excuse that many Christians use, you know, “The poor you’ll always have with you.” But the problem is they’re not finishing the verse, “The poor you’ll always have with you, so be kind to them every day.” Jesus in that verse is quoting Deuteronomy 15. It says, “The poor you’ll always have with you, so be kind to them everyday and lend them a hand and lift them out of poverty.” It’s an action verse, not an excuse verse, and we turn it into an excuse like the homeless you’ll always have with you. Well, that’s not what needs to be communicated. We could live in the city where not one precious human being lives on the streets. And I would love to be part of making that happen in Los Angeles. That would really be the ultimate dream for me. That before I’m gone from this earth that we didn’t wait for heaven to address the situation of homelessness here on earth. 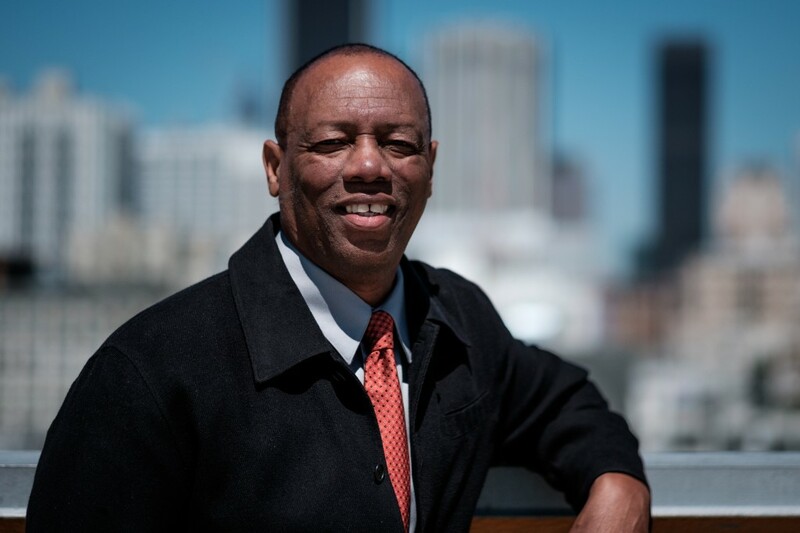 Note: The deadline for the matching challenge gift to help men, women, children, and families on Skid Row overcome homelessness and begin new lives of hope has been extended to June 30. Go to URM’s website to donate. 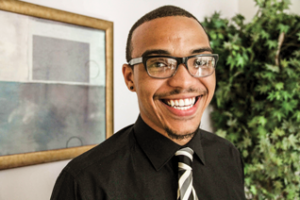 Kenneth Chancey first experienced homelessness at the age of 11, and was a sophomore in high school when his family moved into Union Rescue Mission. Kenneth was a recipient of the 2017 Dare to Dream Award, and today he works for the City of Los Angeles as a Legislative Deputy to Councilman Marqueece Harris-Dawson. Please watch his inspiring speech from the Dare to Dream Gala to learn more about how he was able to overcome adversity thanks to the generous support of donors like YOU, who are making a direct impact in the lives of so many. Join us to help make Christmas brighter for deserving families! Please donate new, unwrapped toys and gifts for children and teens at Union Rescue Mission. How you are giving a precious child and her family the chance to rebuild their lives — and learn the real meaning of Christmas. When I was younger, I thought Christmas was all about decorations, looking at Christmas lights, and getting presents,” says 12-year-old Marisa. “But it’s really about Jesus. I didn’t know that before I came to Hope Gardens. Now He’s my real dad.” That’s important to Marisa because her birth father was a raging alcoholic who emotionally and physically abused his family. He controlled their movements through intimidation and threats, often keeping them prisoner in their own home. And he’s now in jail for other child-related crimes. 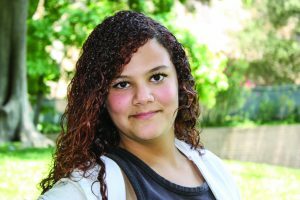 Marisa is just one of nearly 80 children who live with their moms at Union Rescue Mission’s Hope Gardens Family Center, a 77-acre sanctuary that offers transitional housing to families experiencing homelessness like Marisa’s. “She’s changed so much since we got here,” says Marisa’s mother, Jessica. “She’s beautiful, talented, and smart. 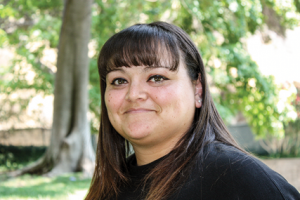 I’m so proud of her.” Marisa came to Hope Gardens, along with her mother and younger brother, in February 2014, after struggling with homelessness for three years after the arrest of her father. Because of the abuse and trauma she experienced growing up, Marisa has trouble remembering much about her childhood. But she is opening up and thriving, thanks to the care she gets at Hope Gardens. “I like Hope Gardens,” she says. “I met my two best friends here.” She’s also very involved in the praise dance group, Bible studies, and other activities. “But the best thing about Hope Gardens,” she says, “is that my mom and I got to know each other better. Before, we were always stuck in bad situations. Now we’re safe and we get to spend more time talking about stuff.” She also enjoyed spending last Christmas at Hope Gardens. “We watched Christmas movies, made wreaths and stockings, and we even built a gingerbread house,” she recalls. “We also worshipped Jesus. And that’s important, because I know I’m a better person than I was before I met Him.” Like any child, Marisa still enjoys the excitement of opening presents on Christmas morning. But thanks to friends like you, Christmas means so much more now. And she can look forward to a real future when all is calm. And all is bright. In 2016, Union Rescue Mission will celebrate 125 years of continuous service to people experiencing homelessness in Los Angeles. URM was founded in 1891, when we took to the streets in gospel wagons to offer food, clothing, and salvation to the less fortunate. Over the years URM has continued and expanded its efforts to feed both the body and the soul, helping individuals and families break the cycle of poverty and achieve self-sufficiency. But really, for 125 years, the work of Union Rescue Mission has been YOURS — YOU are the Mission. Your faithfulness and generosity has transformed countless lives. Stay tuned over the coming weeks and months in 2016, as we celebrate YOU and God’s faithful care for precious men, women, and children. Grateful Awareness of Mercy: Watch how God brought Alan to the Mission and how Alan learned that God wants you as you are. Through God’s mercy and love, Alan now knows he is good enough. 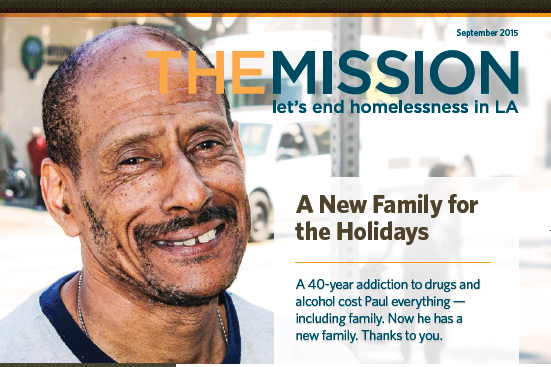 When you make a gift of any kind to Union Rescue Mission before December 31, not only will you make the New Year brighter for men and women experiencing homelessness, you will receive a charitable tax deduction on your 2015 tax return. (213) 673-4825 or send an email to aramirez@urm.org. Marisa’s mother, Jessica, experiences Christmas happiness at Hope Gardens Family Center. Christmas is probably my only good memory from childhood. My mom loved Christmas and went all out every year — decorations, lights, Christmas cookies, the big tree, everything. The problem was the rest of the year. Both my parents were addicts, and my father was also physically, mentally, and emotionally abusive. There was never much love in our home. Then I met my husband when I was 21. At first, I thought he was kind and just wanted me to stay home so he could take care of me. We had two children together — Marisa, who’s 12, and Jesse, who’s 9. We were married for 11 awful years. He drank every day, all day. He was so controlling, we could never leave the house. The kids weren’t allowed to have friends. We lived in constant fear. I tried to escape many times, but I just couldn’t make it on my own. We only got out after my husband went to jail. But we struggled with homelessness for three years before we finally came to Hope Gardens. We’ve been here for a year and a half now, and I can’t believe how blessed we are. It’s so beautiful here. My kids and I are safe, we have our own space with room to breathe, we can relax, and I feel like we’re getting to know each other for the first time without all the fear and trauma hanging over us. And there are so many other great mothers here who each make me stronger. The classes here have also helped me grow into a stronger, healthier, mature woman and mother. They taught me better financial management. We’ve all received Bibles, we’re going to church, and we’re growing in our faith. And now I’m preparing to go back to work. Last Christmas, here at Hope Gardens, was the best ever. In fact, I can say it was the first time in my life I was ever happy. My kids got to relax and be kids. We didn’t have any money, but thanks to Union Rescue Mission’s Christmas Store, I got to give presents to them. We celebrated the birth of Jesus together, because without him we have nothing. And we celebrated our new lives. This Christmas, I really will sleep in heavenly peace. In just a few weeks, Christians will celebrate the birth of our Savior, Jesus Christ, when Jesus brought healing and hope to a world filled with fear, cruelty, darkness, physical and spiritual hunger, and hopelessness. Beginning in January 2016, we’ll also celebrate another birth of healing and hope — the 125th anniversary of Union Rescue Mission’s birth on Skid Row. That’s 125 years of bringing the hope and transforming power of Jesus to precious human beings struggling to survive on these mean, cruel streets. In many ways, Skid Row is worse than ever. But there’s still hope, especially inside Union Rescue Mission, where Christ’s Light still shines, where peace dwells, and where lives are transformed for eternity. It’s our mission. But it’s not really our Mission. It’s yours. For 125 years, thousands and thousands of lives have been saved on Skid Row, because thousands and thousands of generous, caring people like you have partnered with Jesus, and with us, to bring His hope and healing into the dark world. So in 2016, we plan to celebrate — to celebrate 125 years of Jesus’ presence on Skid Row, and to celebrate YOU. Because YOU make it all possible. 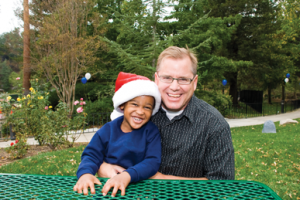 Thanksgiving and Christmas can be difficult for families experiencing homelessness. But for 25 years, Union Rescue Mission’s Christmas Store has brought joy into their lives when they needed it most. 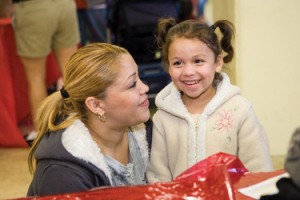 This year, thousands of precious children at Union Rescue Mission, Hope Gardens Family Center, and other agencies serving underprivileged kids throughout the greater Los Angeles area, will receive brand-new gifts because of the 25th annual Christmas Store. On December 10, more than 700 moms and dads with little or no income will enjoy the dignity of being able to provide their children with gifts they select themselves (for free) and give to their children personally. 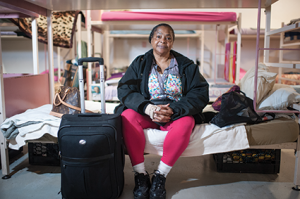 All year-round, Union Rescue Mission embraces people experiencing homelessness with the compassion of Christ, and offers healing and hope to help them find their way home. And thanks to the Christmas Store — and generous friends like you — hundreds of families will find that new hope this holiday season. For information about donating toys to the Christmas Store this year, please contact Victor Ortiz at (213) 316-2779. For most of us, the holiday season is a magical time of excitement and anticipation, gifts, good food, and time spent with loved ones. But for men, women, and children on Skid Row, Christmas is often a painful time without presents, food, a home — or even hope. At Union Rescue Mission and Hope Gardens Family Center, however, men, women, and children experiencing homelessness will wake up with Christmas joy — and the hope for a new life — thanks to generous people like you. 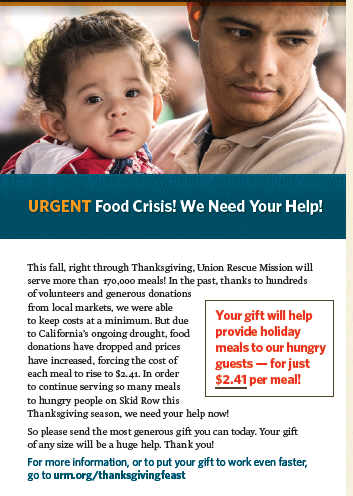 This holiday season, your generous gift of $25, $35, or more will help provide special holiday meals, clothing, and shelter — and, yes, hope — to hurting individuals and families at Union Rescue Mission and Hope Gardens. Please send the most generous gift you can today. Thank you! The season of Advent leading up to Christmas is a wonderful time for thoughtful reflection and joyful anticipation as we celebrate the birth of our Savior. After my parents got divorced when I was in high school, I ended up living with friends, in group homes, and in foster care while my parents battled over custody. When my dad finally got custody, however, we didn’t have adequate housing, so we came to Union Rescue Mission in December 2008. 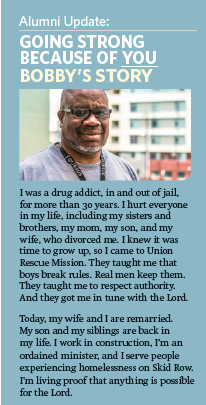 Union Rescue Mission gave us a roof over our heads and gave me the stability I needed. I hope to go into politics and run for office so I can make an everlasting difference in the areas of homelessness, foster care, and elder treatment. 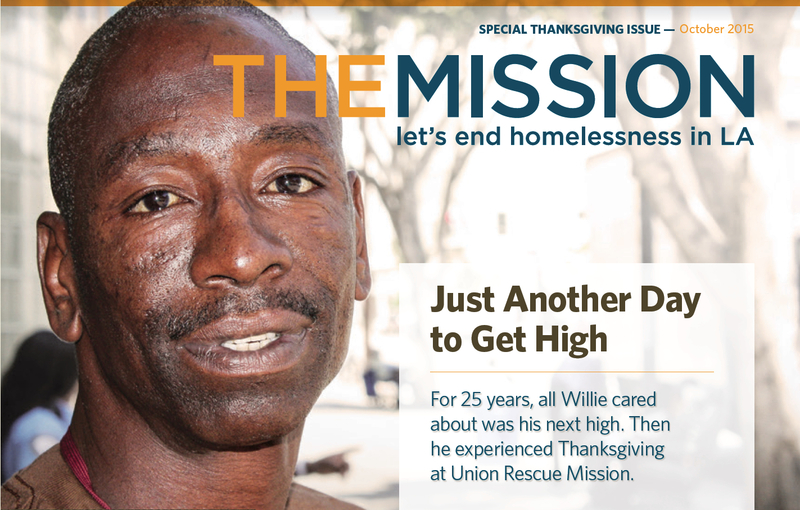 Willie took advantage of everything Union Rescue Mission offers: Bible studies, chapel service, physical fitness, work therapy, counseling with his chaplains, health care — he even got new teeth through the Mission’s dental clinic. But one of the highlights was Thanksgiving, he says. “I was here the past two Thanksgivings,” he recalls. “You can’t believe the number of people who come here to serve folks like me. Those folks really care, and they make a whole lot of people on these streets happy. 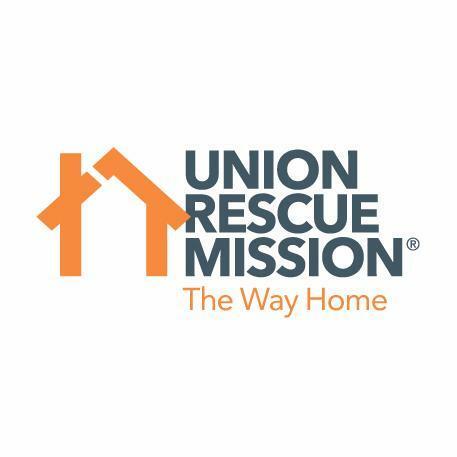 All year-round at Union Rescue Mission, your gifts offer precious men, women, and children experiencing homelessness with safe shelter, nutritious meals, long-term care — and even the help they need to find their way home. Thank you! But right now, due to California’s ongoing drought and a severe drop in food donations, we’re facing a severe crisis this holiday season — our busiest time of year. We desperately need your help! Your gift of $33.74 will provide 14 holiday meals! It still costs just $2.41 to provide a holiday meal to a hungry man, woman, or child. 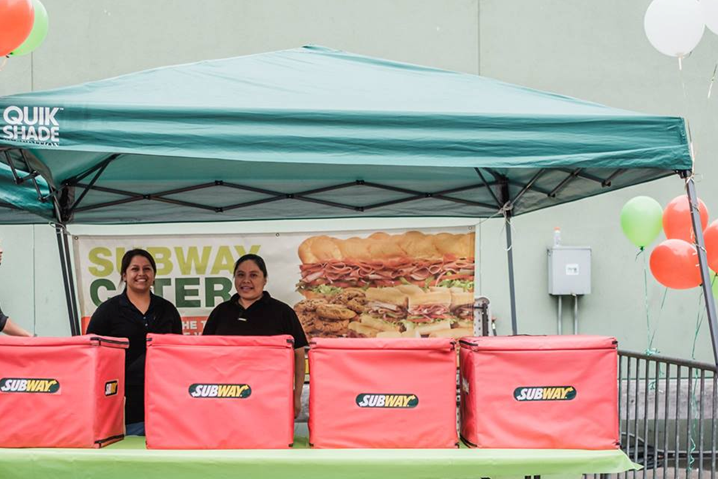 This season, we expect to serve more than 180,000 meals. Your gift of $33.74 will help feed 14 people, $67.48 will help feed 28 people, or any amount you can send will help. So please give generously. Thank you! Special Opportunity to Love Your Neighbor! 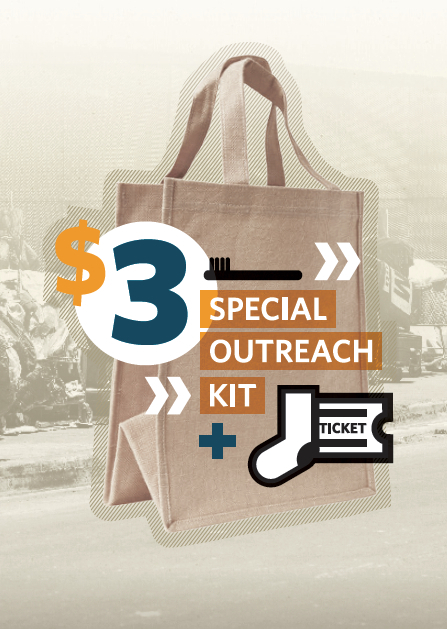 On November 14, URM will hand out 3,000 special kits to all neighbors on Skid Row. These kits are filled with shampoo, soap, toothpaste, mouthwash, deodorant, razors, socks, and a special invitation to celebrate Thanksgiving with us at Union Rescue Mission. For just $3, you can provide one of these special kits to one of our Skid Row neighbors — and add a personalized blessing signed by YOU! Please check the special $3 box on your remit form, then sign the Blessing Card with your first name only. It’s a wonderful way to love your neighbor this holiday season! I grew up in East L.A. I never thought I’d end up on the streets of Skid Row. But I got hooked on alcohol. I lost a good job. I lost my marriage. My drinking got so bad, my own family didn’t want me around. So I ended up homeless here. By October 2013, I was broken down, sick, crying, and defeated by life. Then I came to Union Rescue Mission. Thanks to this place, I opened my life to God. I found what I’d been missing all my life. I found the life God has for me. My family has welcomed me back and I’m even going back to school! People are pouring into Skid Row like never before. The sidewalks outside Union Rescue Mission are crowded and I’ve never seen so much desperation. It’s just chaos out there. But every Thanksgiving — thanks to your generous support — we take these precious folks away from their desperation for a day of joy. With music playing on the sidewalks, dancing in the streets, and the smoke of fried turkeys wafting down the streets, we make sure our guests enjoy the most splendid Thanksgiving ever — and maybe a reminder of how loved they really are. And when that happens, some will take the courageous step to leave the streets behind and transform their lives. Celebrating Thanksgiving at Union Rescue Mission gives us the chance to show our gratitude for all God has given to us by giving ourselves to those who have nothing at all. How well you and I pull this off is a true reflection of how grateful we really are. So I invite you to join with us again this year, offering your time and your financial support to display to the world our thankfulness and our love for others. By high school, Gary was snatching purses, burglarizing homes, stealing cars, and gambling on the streets. Then his brother introduced him to crack cocaine. He was immediately hooked, and his life spiraled even more out of control. Between 1998 and 2012, he was constantly in and out of prison. And when he wasn’t in prison, he wasted his life away on Skid Row. It took 10 more years to see the fruit of God’s promise. In 2009, Gary surrendered his life to Jesus Christ in prison. Before long, he was leading Bible studies and preaching in chapel services, and he even felt God’s call to one day go into ministry. the pastor. He even got married for the first time in February 2013, and in July 2014, Union Rescue Mission hired Gary full-time to drive a truck for their new thrift store in Covina. Real Jobs for Real People — Thanks to You! 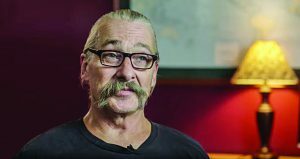 Many of the men and women who come to Union Rescue Mission have a spotty employment history, a lack of marketable job skills, and a history of felonies that can hurt their chances at gaining full-time employment and becoming self- sufficient. These precious people need more than meals and shelter, they need jobs. Real jobs. And that’s where you come in. Your financial gifts and support to URM do far more than provide meals and shelter. 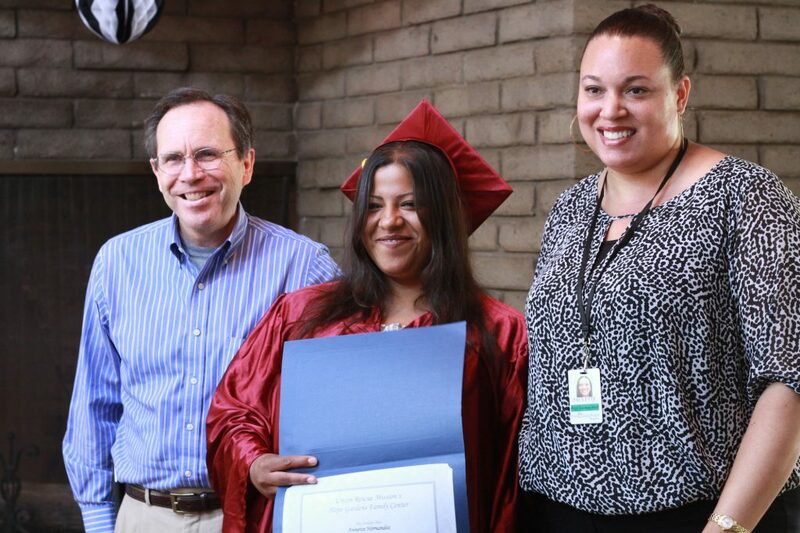 Your gifts help transform lives and help prepare men and women experiencing homelessness with job-preparedness training, work skills, and even job opportunities with employers all over Los Angeles. 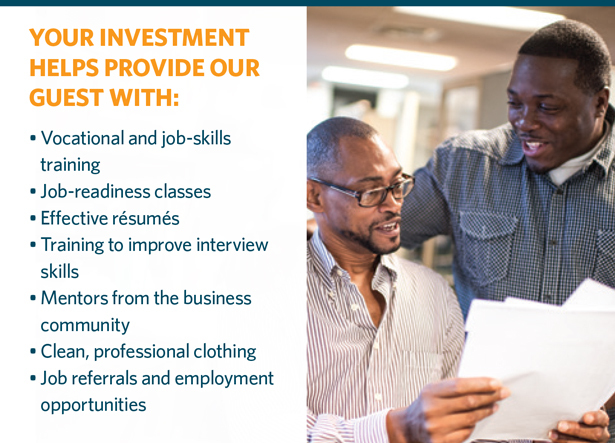 Thanks to you, our Employment Program has already helped more than 100 men and women find sustainable employment that has not only helped them support themselves, but often their families, as well. 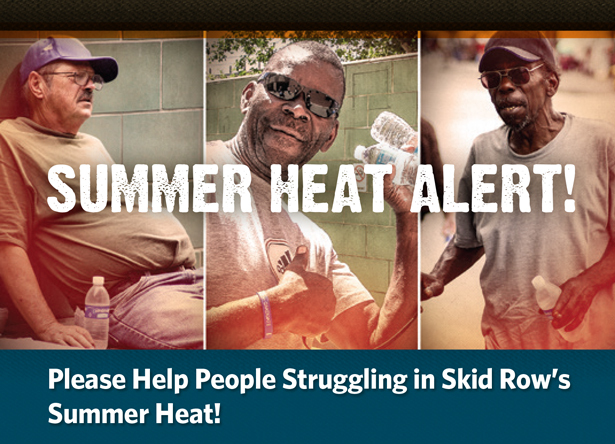 Summer heat on Skid Row is dangerous for the men and women who call these streets home. They desperately need your help. Yet every summer, donations to Union Rescue Mission drop way off, threatening our ability to meet their needs. Your gift today will provide cold water, cool shelter, nutritious meals, and another day of hope to precious people who need your help the most this summer. So please send the most generous gift you can today. Thank you! — Anytime it’s 85 degrees or hotter, we pass out cold bottled water on Skid Row. Water Walks take place Monday through Friday at 2:00 p.m. Text the word WATERWALK to 51555 to receive notifications for our next Water Walk. In 2013, I ended up homeless with my two small children. It got so bad, we had to live in a tent for awhile. Then we came to Union Rescue Mission and Hope Gardens. Hope Gardens helped me give up alcohol and drugs, helped me get closer to God, and they helped me in so many other positive ways. Today, I’m still living at Hope Gardens, but I have a job now and soon I will move into my own place with my children. All I want is to be able to support my children, and thanks to Hope Gardens and generous friends like you, I’m able to do that now. Struggling men and women who come to Union Rescue Mission seeking help need more than meals and shelter. They need more than sobriety. They need jobs. Real jobs. 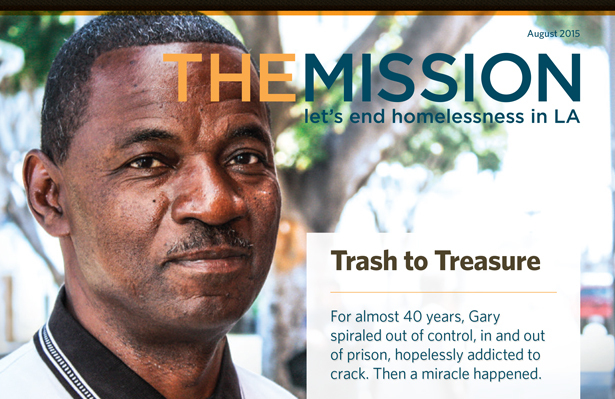 I know one guy here at the Mission who came to us after a 20-year addiction. He’s clean, sober, and ready to go home. But he’s scared. What will happen to him when he leaves? He worries that if he can’t find work, if he can’t support himself with dignity and self-respect, he may end up right back where he started. Thankfully, he’s now participating in our Employment Program and going to school. He knows we will provide him with the skills, the support, and the connections he needs. And we will walk with him every step of they way until he finds a much-needed job. But really it’s you. Your financial gifts to URM help provide men and women experiencing homelessness with training, work skills, and even job opportunities with employers all over Los Angeles. A life transformed, followed by a job, followed by a home. That’s our strategy. But you’re the one who makes it happen.